Manuel Lucena-Giraldo is Historian. Research Scientist in the Spanish Council for Scientiﬁc Research and Associate Professor in IE Business School/IE University and OBS-Planeta Universities. He was Visiting Scholar at Harvard University, Lecturer BOSP in Stanford University and Visiting Professor at Tufts University (Boston), Javeriana University (Colombia), IVIC (Venezuela), Colegio de Mexico, University of the Andes (Chile and Colombia) and St. Antony´s College (Oxford). He was Education Attaché in the Spanish Embassy in Colombia and held foreign education positions. He was a member representative of the CSIC at the European Science Foundation, COST Network Manager and Research Project Advisor at the Carolina Foundation. 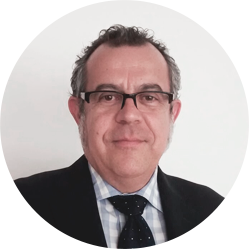 He is assistant Editor in Culture & History; Member of the board of Revista de Occidente and the Advisory Committee of “National Geographic” in Global History. He is a member of the Royal Academy of History from Spain, the Colombian Academy of History and the European Academy. His publications include a number of books on travels, scientific expeditions, cities, images of nations, empires or globalization. He is co-author of The Oxford Illustrated History of the World and Professor of writing (non-fiction) in Penguin Random House School.